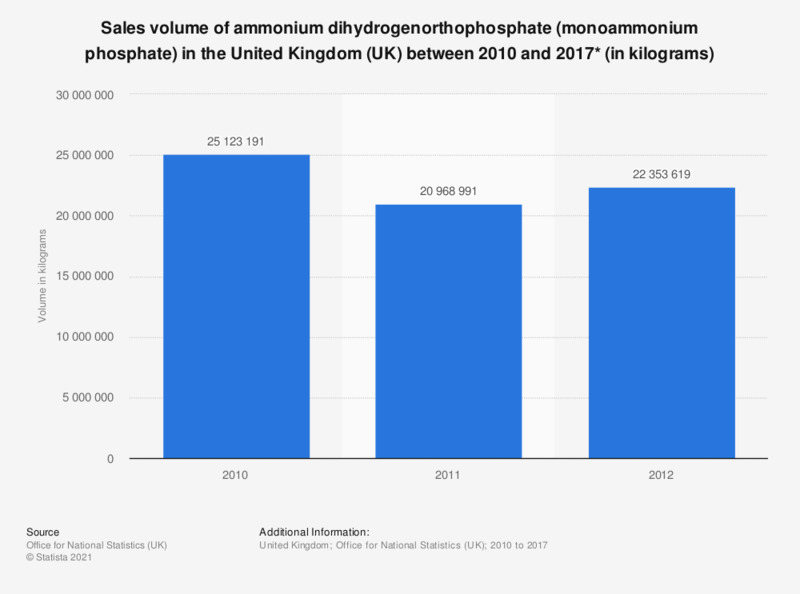 This statistic shows the sales volume of ammonium dihydrogenorthophosphate (monoammonium phosphate) based on PRODCOM estimates** in the United Kingdom between 2010 and 2017*. The UK experienced a decrease in sales volume over this period. The sales volume reached 22.4 million kilograms in 2012. Data for 2013, 2014, 2015, 2016 and 2017 were suppressed by the source. Ammonium dihydrogenorthophosphate (monoammonium phosphate) and mixtures thereof with diammonium hydrogenorthophosphate (diammonium phosphate) excluding in tablets or similar forms or in packages of a weight of 10kg or less.